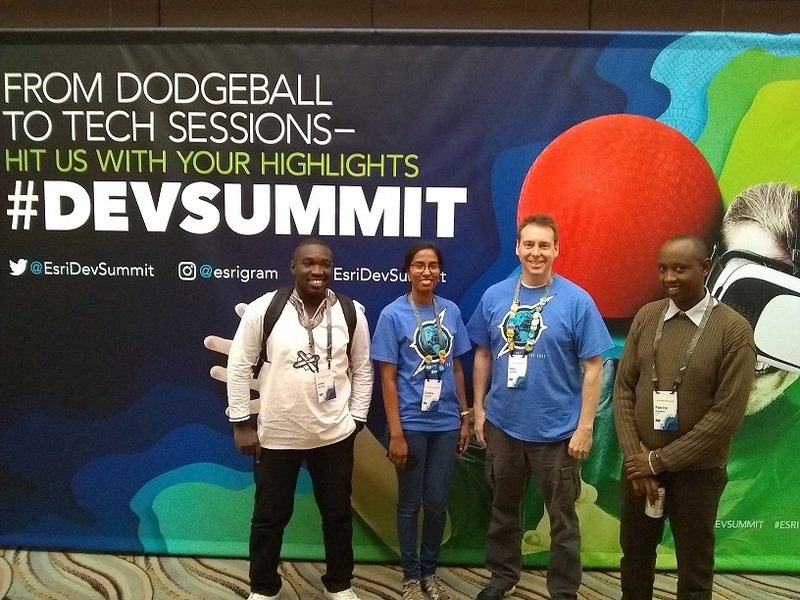 The ESRI Dev Summit is an annual conference giving software developers using the ESRI platform to learn and interact with the latest state of the art developments, innovations and improvements on ESRI GIS technology. RCMRD GIT experts Patrick Kabatha and Maungu Oware together with SERVIR coordination office GIT experts Billy Ashmall and Githika Tondapu attende this year's summit held in Palm Springs, California (USA) from March 4th to March 9th 2018. Esri Developer Summit is designed to show participants how to build cutting-edge apps using advanced mapping technology from Esri. The summit is made up of six days of pre-summit training, plenary sessions, demos, workshops and lightning talks on cutting-edge applications using advanced mapping technology from ESRI covering Desktop GIS, Web GIS, 3D GIS, Enterprise GIS, Big Data Spatial Analytics, Imagery and Deep Learning.